Yiddish poet; born at Boksha, government of Suwalki, Russian Poland, Dec. 28, 1862, educated at Boksha, Suwalki, and Warsaw. He worked as a tailor in New York and London and as a diamond-cutcer in Amsterdam, and settled in New York in 1886, since which year he has been connected with the editorial staffs of several leading Jewish papers. At present (1905) he is editor of the "New Yorker Morgenblatt." In 1904 he published a weekly entitled "Der Ashmedai." 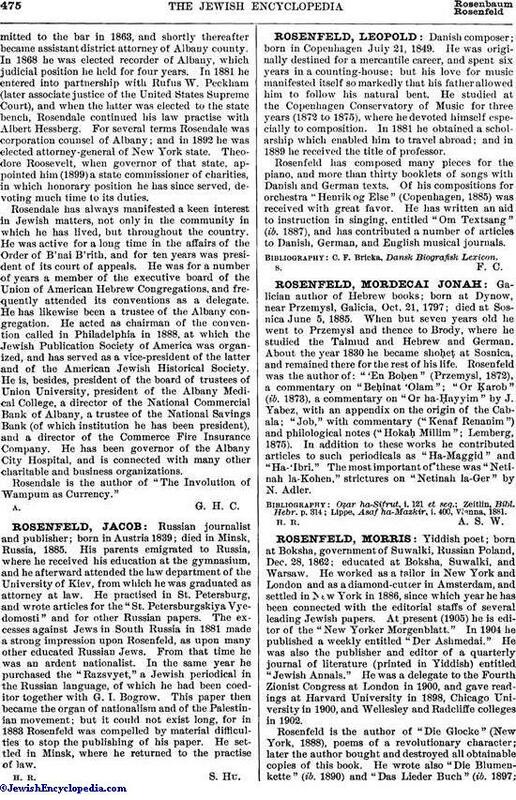 He was also the publisher and editor of a quarterly journal of literature (printed in Yiddish) entitled "Jewish Annals." He was a delegate to the Fourth Zionist Congress at London in 1900, and gave readings at Harvard University in 1898, Chicago University in 1900, and Wellesley and Radcliffe colleges in 1902. 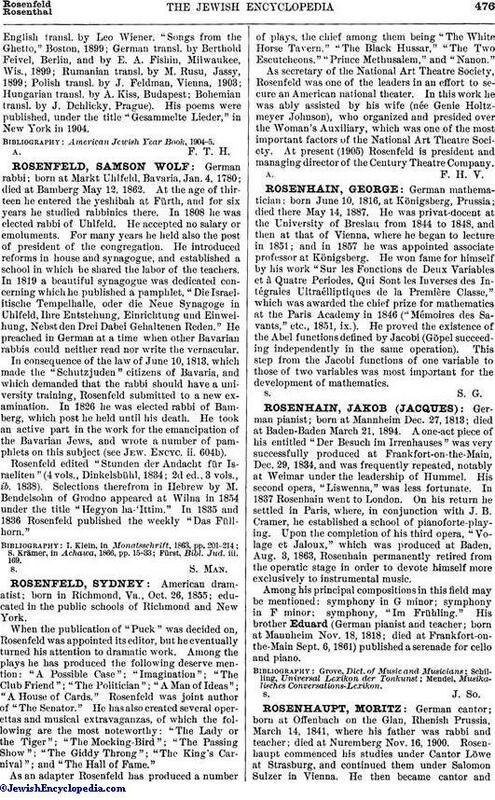 Rosenfeld is the author of "Die Glocke" (New York, 1888), poems of a revolutionary character; later the author bought and destroyed all obtainable copies of this book. He wrote also "Die Blumenkette" (ib. 1890) and "Das Lieder Buch" (ib. 1897;English transl. by Leo Wiener, "Songs from the Ghetto," Boston, 1899; German transl. by Berthold Feivel, Berlin, and by E. A. Fishin, Milwaukee, Wis., 1899; Rumanian transl. by M. Rusu, Jassy, 1899; Polish transl. by J. Feldman, Vienna, 1903; Hungarian transl. by A. Kiss, Budapest; Bohemian transl. by J. Dchlicky, Prague). His poems were published, under the title "Gesammelte Lieder," in New York in 1904. American Jewish Year Book, 1904-5.